If you're looking to save a few bucks, buying some used ATV tires and wheels is a great place to start. There are hundreds of used tires and wheels for four wheelers listed every day online. The trick is how to find them. Not to worry - we've done the hard work for you. Just click the customized link below to see hundreds of used tires and wheels for sale. Best Deals on Used ATV Tires. How to Save Money on ATV Tires. If you've never thought about going with used tires before - there are some good reasons to consider it. 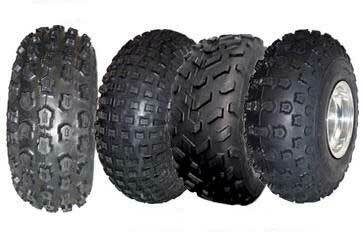 Save money - used tires with plenty of life left in them can be had for half or less than the cost of new ATV tires. Try a different brand of ATV tire or a different tread type without spending a fortune. As much as ATV tires cost today, most of us can't afford to make a mistake with a new set of tires. Replace worn out tires on an ATV that you have for sale. Increases the value of the ATV and makes it much easier to sell. Having a nice looking set of tires can increase the value of your ATV considerably. Have a set of spare tires available. If you ride in rough terrain that causes a lot of punctures or slices, used tires as spares make sense. Why buy new tires if they're likely to have a hole in them after the first ride! Used specialty tires like sand paddles or mud and snow tires are fine if you only need them occasionally. Why buy new ones if they only sit in your garage most of the time? We are all looking for ways to economize these days. We think used ATV wheels and tires are a great way to save money without sacrificing performance at all.